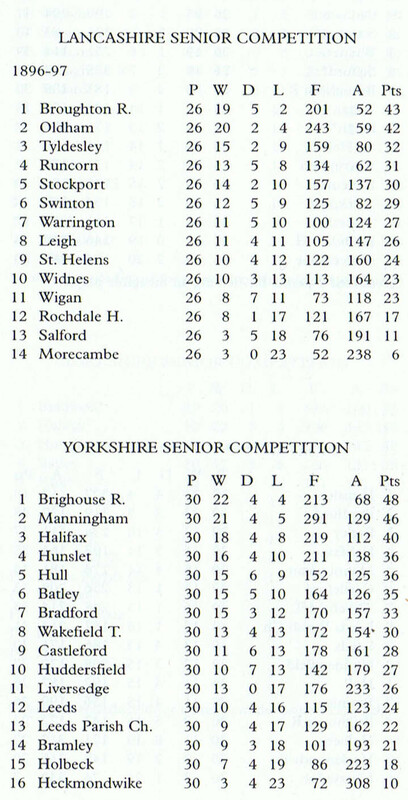 With so many teams signing up to the new Northern Union, now in its second season, the league was split into county (Lancashire and Yorkshire) competitions. The Challenge Cup was also held for the first time in this season. Scoring: Try - 3 points. Conversion - 2 points. Drop Goal - 4 points. Penalty - 3 points. Goal from Mark - 4 points. Eight new teams joined the League, and so it was split into two county leagues. The new teams were Bramley, Castleford, Heckmondwike, Holbeck, Leeds Parish Church, Morecambe, Swinton, and Salford.